After yesterday's checklist on what to consider before you publish, I received some great feedback, and so I decided to follow up with what to consider after you publish. For some of us, blog promotion is intuitive; for others, promotion seems awkward and consequently, we leave readership to chance and word of mouth. And for some of us, our families and friends may not know that we blog, for fear of judgement or just not understanding what it is that we do. However, if our goal is to build readership, and for some of us, sponsorship, then it behooves us to become social media savvy. If you have not connected your blog to social media accounts, then this a first step. 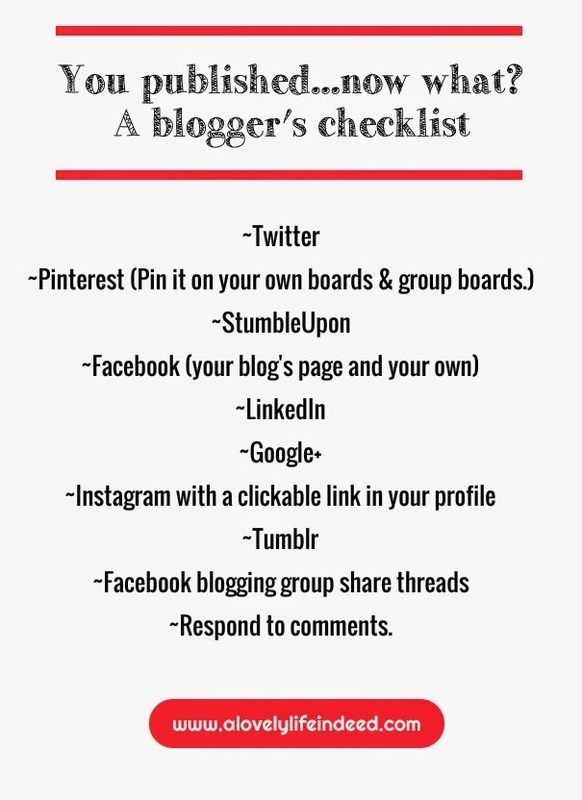 You can find tutorials online that demonstrate step-by-step instructions for installing social media buttons onto your blog posts. Give your readers the opportunity to share your work. Once you are connected, then you can get started with promotion. Here are some places where you can post links and begin your journey in blog promotion. Tomorrow, I will be featuring a piece on social media management and things to consider with each platform. Which social media platform drives the most traffic to your blog? Do you have favorites? I totally don't know anything about StumbleUpon! I have an account and just updated it to MAYBE start using it....but I really know nothing! Great follow-up! Pinning this one, too. Great article I'm going back to read yesterday's now. I find my favorite depends on what I am promoting. I run 2 blogs one is more personal and one is a travel blog. I prefer Google+ over any of the others with Twitter coming in a far second. With the travel blog I prefer Pinterest because of the pinnable pictures that I can post that link back to that site. I hate Facebook most of all. I'm loving your lists. The top 3 platforms that send traffic to my blog are 1. Facebook, 2. Twitter 3. Pinterest. i'm not on stumbleupon...will look into that today, thanks! Makes all the difference just seems so overwhelming. Good reminder. There are just too many social media outlets!! It's so hard to do them all!! There are so many sites to share it on. I tend to pick the top 5 otherwise it gets to be too much! I try to focus on a few too; otherwise I feel like I'm in the weeds. I still don't completely understand StumbleUpon. I try to focus on only a few; otherwise I feel like I'm in the weeds. Baby steps. :-) Thanks for stopping by, Lindsay! Facebook seems to get the least results for many bloggers. Pinterest drives a lot of traffic for me too. You're right though; understanding your demographic and promoting accordingly make all the difference. Thank you for stopping by, Rosa! Thanks you for stopping by, Arielle!